The following chart suggests that in 2009, Infrastructure Australia thought public transport was a higher priority than road expansion in Australian capital cities. 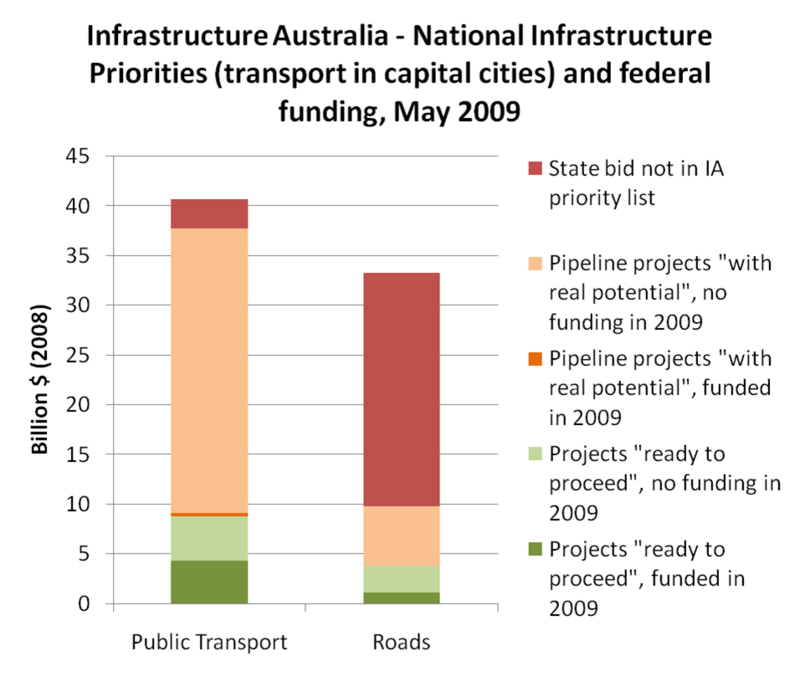 It compares state government bids for capital city transport projects (in 2008), what Infrastructure Australia thought were the priorities (in May 2009), and of these, which projects received funding in the 2009/10 federal budget (May 2009). Clearly public transport projects came out much better than urban road projects when Infrastructure Australia applied their selection criteria, which included climate change, livability, sustainability and productivity (I suggest you read the Infrastructure Australia publication for more details). Of the state public transport bids, only light rail in Canberra, and a small project in Geelong were not shortlisted. Most city road projects were not short-listed. Infrastructure Australia short-listed public transport projects with four times the value of the road projects. Federal funding was a 5:1 ratio of public transport to roads. (Note: these ratios are for capital city projects only). There was also federal funding for about $1.2b of country highway projects that were not short-listed by Infrastructure Australia. Note: Some projects were not entirely road or public transport but I have classified them by the dominant component, and there were some small city transport projects that were not listed by IA, but were funded anyway. However the impacts of these issues would be very small on the chart above. You are currently browsing the archives for the Funding category.